Clean up your lawn with a decoration that will surely spook your neighbors this Halloween! The Spooky Spirit Leaf Bag is a great way to clean up all that autumn foliage on your lawn and look great doing it! This scary decoration consists of a white 30 gallon bag and a cardstock ghost face. 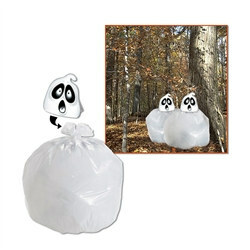 After cleaning up all the leaves on your lawn, put them in the bag and attach the ghost face to the top. The Spooky Spirit Leaf Bag really does look like a moaning and groaning ghost. Each bag measures 35 by 27 inches. Be sure to check out all our other ghastly Halloween decorations, like the Bat Whirls and the Halloween Mobile.